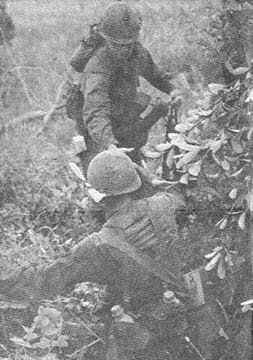 Scout teams of former Viet Cong guerillas are being used for the first time in the 25th Inf Div. Officials say they have been extremely effective. The 2d Bde's 1st Bn (Mech) 5th Inf, has used the teams made up of Viet Cong ralliers to the government side for several weeks. The battalion claims they have been largely responsible for uncovering hundreds of hidden bunkers and storage caches. 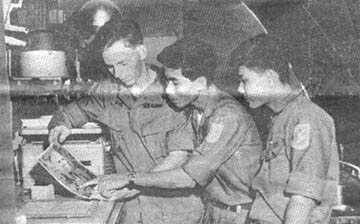 Under the so-called "Kit Carson" program, American units are allowed to hire former Viet Cong for scout duty after they have completed preliminary "Chieu Hoi" training at the province center. Many of them are well versed in Viet Cong camouflage and storage techniques. Units attempt to use them in the same area they operated as VC. The scout is treated the same as the average G.I. and is authorized to carry a weapon for personal protection. The only problem battalion officials say they have met is food. Scouts generally like American food, but most of them say the Army just doesn't serve enough rice. They often cook their own. Their mission with the mechanized unit is search and reconnaissance, work that can be exhausting and dangerous. But most of them can't get enough of it. One rallier scout says he is anxious to do a good job with the "Mech" to clear his name. He explains that joining the Popular Forces is his eventual goal. Battalion officials accepted the scout team on a four week test basis. "We were quickly convinced of their value," said intelligence sergeant MSG Milford Pearce of Greenville, S.C. "They were a tremendous asset in finding caches and identifying local Viet Cong." "A crew that would stay in a flaming tank and man the main gun, getting off a dozen rounds is doing something that takes one hell of a lot of guts," said MG F. K. Mearns, 25th Div commander, standing before the four men who the night before had broken the back of a Viet Cong ambush. The crewman had remained in the tank after it had been hit repeatedly by RPG-2 and RPG-7 rockets and was in flames, to fire 90mm rounds into Viet Cong dug-in positions along the road. Enemy losses after the 25-minute fight - nine killed, five weapons captured, and several blood trails that led into the woods. Casualties from Bravo Trp, 3d Sqdn, 4th Cav - none. The crewman are: tank commander, SSG Thomas A. Reneau, 22, of Becoit, Wis., driver, SP4 Thomas C. McBrearty, 23, of Los Angeles, gunner, Larry L. Denison, 20, of White, S.D. ; and loader, PFC Charles George, 19, of Baltimore. The tank was in a column of armored personnel carriers whose mission was to search for Viet Cong elements operating at night along Highway 1 from Cu Chi to Trang Bang. The highway is the main supply route extending through Trang Bang to the 3d Bde's base camp at Tay Ninh. Five kms southeast of Trang Bang the Viet Cong sprung their ambush with rockets, small arms, automatic weapons and grenades. "We were the first to get hit," explained Reneau," and immediately, George and Denison swung the turret around and started firing the 90mm. We took five more RPG-2s, one of which knocked out the electrical system. We had to elevate and traverse the turret by hand." With the tank in flames from diesel fuel, the crew continued to fire. "We got off a dozen rounds, but the heat got too much for us. Small arms ammo stored in cans at the rear of the turret started popping, so we had to get out." Shortly after the Viet Cong broke contact and ran. "Normally, we recon by fire," explained McBrearty, "Which means when we approach a likely ambush spot, we fire a few rounds. This way we can trigger an ambush before the column drives into the middle of it." 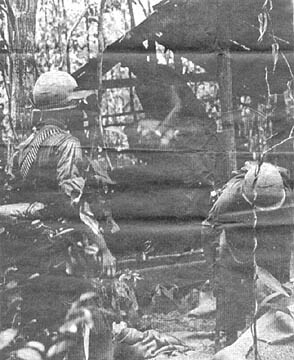 There were houses in the vicinity of the ambush site which NcBrearty said was the reason they didn't rceon by fire - giving the Viet Cong control over the time factor. The houses were checked after the fire fight and all were found to be empty. "Apparently the Vietnamese had taken their animals and left before the ambush started," said Reneau. "We had gone by that same spot an hour before and saw nothing. It was a well planned ambush." For their actions, McBrearty, Denison and George received Bronze Stars with "V" devices and Reneau was promoted to staff sergeant and received a Silver Star - just 24 hours after the incident. Reneau's comment was, "The greatest thing was MG Mearns coming down here to see us. I felt wonderful when he let me pin the awards on my crew." DAU TIENG - What was supposed to be a routine training mission for the new members of the reconnaissance platoon of the 2d Bn, 12th Inf, turned into the real thing recently when seven VC were spotted in the Ben Cui Rubber Plantation, southwest of Dau Tieng. "As we moved in, the Viet Cong started to disperse and we opened fire with the .50 cal. machine guns," said 2LT Edward Domaleski, the recon platoon leader. 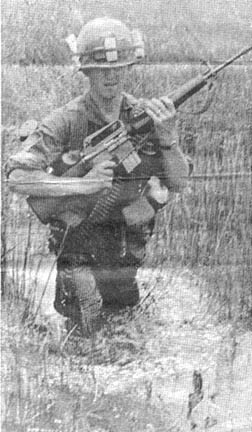 "They went into the thick jungle so I had the platoon form a perimeter while firing the "fifties" and M-79's (grenade launchers) in the direction of the fleeing VC." A search of the area after artillery had been called in revealed that the VC had left behind seven bicycles, ten ponchos, assorted tools, 100 feet of rope, two gas masks, cooking utensils and a lantern. An Air Force forward air controller (FAC) attached to the 25th Inf Div has become a firm believer in the pinpoint accuracy of the Army's field artillery. MAJ William E. Beck from Milwaukee, was on a flight over the Oriental River 65 kms northwest of Saigon checking river traffic, when his observer-crew chief, Airman Second Class William Davis of Youngstown, Ohio, spotted what looked like a sampan in shadows formed by the dense overhang along the shore. Beck made a second pass over the spot and confirmed that what Davis had seen was a heavily loaded sampan with two armed VC aboard. A report had been handed to Beck just before takeoff concerning activities of a sampan loaded with supplies in the area. While Beck radioed for an air strike, Davis plotted the position on his map. Beck was advised that aircraft were not available. An alternative plan came from a 2d Bde fire support base where 105mm howitzers of the 1st Bn, 8th Arty, were on station. Beck made radio contact with CPT Richard Manupella, Charlie Btry, commander from Flint Mich. Coordinates were given and minutes later six howitzer rounds landed in the Oriental River. Beck's next radio transmission was, "End of mission . . . one sampan with munitions destroyed and two Victor Charlies killed, over. . ."
Commenting on the artillery's accuracy, Beck later said, "There's no Air Force stamp on Charlie Btry's projectiles, but they could give our jets a run for their money." Detaining a Viet Cong is sometimes just like finding a needle in a haystack. During a recent search and destroy operation by the 1st Bn, 27th Inf "Wolfhounds," an armed Viet Cong ran from a hedgerow towards a nearby farmyard. A Helicopter gunship orbiting overhead fired and wounded the enemy soldier as he ran but he reached a large hay mound in the yard and tunneled in. Battalion Commander LTC David Hughes of Colorado Springs, Colo., ordered his command chopper to the ground and began probing through the hay until he found his man weak from wounds. 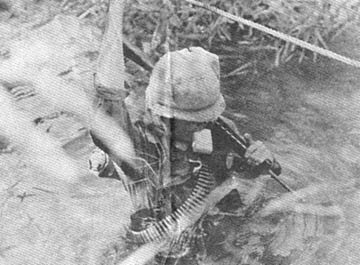 A Viet Cong soldier too eager to get to work in a rice paddy, recently led a 25th Inf Div unit to his concealed uniform, weapon and ammunition. Bravo Co of the 1st Bn, 27th Inf "Wolfhounds," sweeping through a portion of the 2d Bde Operation "Kolekole" area spotted the man sitting by a house. When he saw the soldiers he jumped to his feet and ran at top speed to a nearby rice paddy, ripped off his shirt and began working feverishly. "He was just too enthusiastic about working his crop," said SSG Jerry Bateman of Evansville, Ind. During questioning by a Vietnamese interpreter, the man admitted he was a local Viet Cong and volunteered to lead the unit to his weapon. Happy are all free peoples, too strong to be dispossessed; yes"
But blessed are those among nations who dare to be strong for the rest. The Communist dominated Viet Cong have five reasons for terror. In this week's TLN we will give only two of them - the others being given in later editions. A successful terrorist act does much to create an aura of invulnerability within a guerilla band and helps bolster spirits throughout the insurgent organization. One captured document declared, for example, that terrorists acts in Saigon had "aroused enthusiasm among the people." Radio Liberation, after a terrorist act in Saigon, was quick to take credit for it in the name of the National Liberation Front (NFL), as usual in boastful terms. Obviously the broadcasts were aimed as much at the faithful as at the enemy. Kropotkin called terror, "the propaganda of the deed." Undoubtedly there is no cheaper or easier way for an insurgent band or dissident group to single itself out from other opposition than by the use of terror. In the early period Viet Cong terrorist acts quite obviously had been advertising the movement as one of its objectives. For example, a civilian might be shot down in a market place after which his killer would remain on the scene long enough to pin a note to his shirt even though it increased his chances of apprehension. The leadership wanted no ambiguity, no unexplained killings. In some cases it would go so far as to issue leaflets denying the killing of individuals, asserting that they were killed by bandits. But of course this sort of activity cuts both ways - it advertises but it also horrifies, especially abroad. Thus on Jan. 12, 1966, Yugoslavia, the United Arab Republic and Algeria jointly urged North Vietnam and the NLF to cease their terror activities, quite obviously because terror was hurting the North Vietnamese and NLF image in their countries. Apparently there was never any reply to this appeal. SAIGON (MACV) - Plans should be made now by members of the U.S. Armed Forces to purchase and mail Christmas gifts at an early date, a MACV spokesman said recently. The period of Oct. 1 - Dec. 31 marks the annual workload peak for U.S. military postal activities in Vietnam and thus packages to be mailed home, especially those going via surface means, should be sent early. - Mail early. Surface mail should be delivered to the appropriate military postal activity before Nov. 1. - Wrap and address packages carefully. Every year many poorly wrapped and addressed packages never reach their destination. Put the address and your return address inside the package as well as on the wrapping. - Consult local military postal activities for details regarding weight and size limitations and customs label requirements. SAIGON (MACV) - Interest earned on money saved in the Uniformed Services Savings Deposit Program (Public Law 89-538) is taxable and must be reported by members of the U.S. Armed Forces for the year the interest and principal was either paid or made available. This is the substance of an opinion published recently by the Internal Revenue Service according to the MACV Staff Judge Advocate office. In simple words, it means the serviceman saving money under the program in 1967 at the 10 per cent interest rate and who completes his tour in 1968, reports the interest earned when he files his 1968 income tax return. SAIGON (MACV) - The Republic of Vietnam Campaign Ribbon, authorized for wear by U.S. Forces in 1966 for service in Vietnam, may be worn only "with device." The device is a small silver plate with the legend "1960". Criteria for acceptance and wearing of the ribbon are six months service in South Vietnam since 1960 or six months service during that period outside the geographical boundaries of the country in direct combat support operations. SAIGON (MACV) - Tape recordings going from Vietnam to stateside addresses are not subject to customs inspection and therefore do not require customs tags, according to a recent announcement by a MACV spokesman. As long as the tapes have "the character of personal correspondence," they may be mailed free of postage by any member of the U.S. Armed Forces at any military post office in Vietnam or its contiguous waters. The tapes are handled the same as personal letter mail when received at the San Francisco Postal Concentration Center for further movement within the U.S.
A relatively minor incident during a 25th Inf Div operation demonstrates the effectiveness of U.S. Army-Air Force teamwork. "Hello FAC, we have a four man VC ambush between us and our extraction zone. They're about 50 meters from us; I don't think they have us spotted." "That ambush will have to be wiped out if we're to be extracted as planned. They're sitting where the north-south trail intersects the southern edge of our recovery clearing." "Your target is a VC ambush three miles to the south of our present position. The ambush is located in that finger-like clearing, where the trail intersects the south side of the clearing." Tiger lead acknowledges: "Rog FAC, we have the target in sight. You're cleared to mark it any time - we're ready to work." The FAC continues: "The friendly patrol is some 200 meters to the southwest of the ambush. They'll not be marking their position for obvious reasons. Standby one while I talk with ole 'Whispering Smith' down there." Switching radios the FAC calls the LRRP commander: "Have your men taken cover?" "Rog FAC, we're ready - go to it!" whispers the LRRP commander. "Sounds good, FAC; happy hunting - we'll let you know what it looks like from our vantage point." "OK troops, but be sure to keep your heads down," warns the FAC. "Hello Tigers," the FAC calls the fighters, "Ready to roll in for my mark, do you have me in sight? " "Rog, FAC, you're cleared to mark, and Tiger O-1 is rolling in with two bombs." The FAC's smoke rocket finds its mark only two seconds before Tiger O-1 drops two perfect bombs directly on the ambush site. "Two on the money lead!" the FAC confirms. "Number two, lay yours down the trail." "Rog, two is rolling in,"
"Cleared in, I have you in sight," the FAC replies. "Beautiful, that should take care of anybody trying to 'dee dee' down the trail!" After three more deadly passes, the FAC asks Tiger 02, "Feel pretty good about dropping those low drag 500's that close to the friendlies?" "No sweat, FAC; am I cleared in? " says the pilot of the F-5 perched to roll in on a dive bombing pass. "Rog, you're cleared in, I have you in sight," radios the FAC. "One bomb away - and - right on target! Beautiful two you're cleared to do that three more times." "Rog FAC, rolling in from the north again," replies Tiger 02. "You're cleared in - one bomb away - and - bingo; on the money again! You're doing better with those low drags than most of the 'jocks' are doing with their high drags. Keep it up!" "Rog - in from the north," repeats Tiger 02. "Cleared in - how 'bout that shack again (direct hit) - must be your day;" exclaims the FAC. After the fourth perfect bomb, the FAC radios, "That should do the trick, hold high and dry while I confer with ole 'Whispering Smith' down there." "Rog - Tigers high and dry," chime the fighter pilots. "How did it look to you from your angle?" the FAC asks the LRRP commander. "FAC, my observer says those four Charlies were wandering to and fro on the trail when that first drop occurred - looks like you wiped them out. We'll be exploiting that strike in a minute for their weapons, but take four body count right now. I'll give you further results later. Sure nice to have you guys around when we're in a pinch." The FAC replies, "Glad to be of assistance, See you this afternoon." Switching radios, the FAC calls Tiger O-1 flight: "Hello Tigers, this is your FAC with the BDA, ready to copy?" "Rog, go ahead," Tiger O-1 cuts in. The FAC continues "your target coordinates were XT- ; on target at 1130, off target at 1140, 100 per cent ordnance in the target area, 100 per cent target coverage and four KIA body count. Those troops down there really appreciate your work. Outstanding ordnance delivery, especially those bombs, 02; best I've seen in a long while." The flight leader returns, "Roger FAC, enjoyed working with you; see you at the O-Club bar at Bravo Hotel. Tigers, let's go button five." 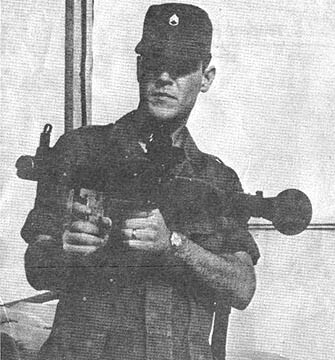 Later after a daring extraction covered by split second coverage from Army gunships, artillery and USAF fighters, the LRRP commander has an informal chat with the FAC. "We found four of them pretty badly mangled; never knew what hit them. We found one of their weapons. Sure glad those jet jockeys were hitting on the money today. It would have been curtains for us had they missed." The FAC confides, "Believe me, we're always glad to help you out; hope to work with you again soon." "Short-stop" and "hypo" are the only English words known by CPL Nguyen Ho and PVT Thai Van Thuan. This situation should change in the next 45 days as the two Republic of Vietnam soldiers have been assigned to the 25th Div's 125th Sig Bn photographic facility for training with U.S. equipment. Both men, according to CPT Brian Bland, Div photo officer, are getting practical experience with camera equipment and lab work. "They have had a limited amount of photo training," says Bland, "and they are familiar with some of our equipment." The shop work is not all they'll be trained in. According to Bland, "As soon as they become proficient with our equipment they will go on photo assignments with the regular photographers." The progress of the soldiers will be noted in a report to the 25th ARVN Div at the end of the training program. "Our own men are excited and enthusiastic about the program," Bland concluded, "as are all the personnel in the battalion. This person-to-person attitude has grown since the battalion adopted the Vietnamese ward in the 12th Evac." For three years, people of a small village northwest of here heard the Viet Cong tell them that the Americans would steal their rice, beat their children, and kill their animals. Now, several months after a 25th Inf Div unit moved into the area, those same people are pointing out Viet Cong booby-traps and volunteering information on enemy troop movements. "When we first entered the village, the people ran for their homes," said CPT Albert R. Amos of Mobile, Ala., civil affairs officer for the 2d Bde's 1st Bn (Mech), 5th Inf. "They were convinced that we had come to kill and loot," he said. After two months of an intensive civil affairs program, the village has changed its mind. "At first only the children came out when we were in town," explained Amos, "but pretty soon everyone came for medical treatment and clothing." Last week when a battalion soldier began pushing his way through a hedgerow, two children ran up and pushed him away. Probing the hedgerow he uncovered two VC booby-traps. Several days later mines were pointed out on the main road, often traveled by U.S. civic action soldiers. DAU TIENG - LTC Ralph W. Julian, commander of the 2d Bn (Mech), 22d Inf, for nine months, passed the leadership of the battalion to LTC A. G. Norris in a ceremony here recently. After the ceremony, Julian was presented the Silver Star and the Air Medal with oak leaf cluster by BG Donald Bolton, the assistant commander of the 25th Inf Div. The Silver Star was awarded for his part in the Battle of Soui Tre. Julian has been reassigned to the Command and Staff College at Fort Leavenworth, Kan.
Norris obtained his commission at Auburn University and his masters degree in Statistics from the University of Alabama. During the Korean War, he was assigned to the United Nations Command Military Armistice Commission Support Group. Norris had been serving as the 25th Div Civil Affairs Officer before he took command of the 'Triple Deuce." To get a message to the Viet Cong, the 3d Sqdn, 4th Cav, air-dropped 50,000 special leaflets. The 25th Div mechanized unit has been running armored columns along Highway 1 at night from Cu Chi to Trang Bang. Their mission - to secure the road for night convoys. "Your ambush of a platoon from the 3d Squadron, 4th Cavalry near An Binh on 12 September was unsuccessful. You had the most modern weapons available to the Viet Cong but did not kill a single U.S. soldier. You damaged one tank, but what price did you pay? A tank can be repaired but what can be done for your comrades that were killed? U.S. Forces found the bodies of nine of your comrades. How many more were killed and wounded? The 3d Squadron, 4th Cavalry captured 1 RPG-7, 2,RPG-2s, and 2 AK-47s and many other items. How many more weapons can you afford to lose if you choose the time and place for a battle and still cannot win, what chance do you have of winning this war? "One tank was hit with RPG-2 and RPG-7, and 57mm Recoilless Rifle fire. This same tank fired 12 anti-personnel rounds at you after being hit. How good are your weapons? What good does it do to hit a tank, if the same tank can continue to fire back and kill you. U.S. Forces are trained in countering ambushes. They have the armor protection of tanks and armored personnel carriers and the fire power of many tanks, artillery pieces, and gunships. They are not hurt by your ambushes, but you may be killed in the next one." The seven-man patrol quietly wound through the thick jungle. Suddenly the silence was shattered by the burst of a booby-trapped grenade. Ten miles from the nearest outpost, the men were faced with evacuation of two wounded. However, neither that patrol nor any other Allied unit in Vietnam will be faced with the problem of carrying men to medical facilities, or even carving out helicopter landing zones in the middle of the jungle. A new device, recently demonstrated at the 25th Inf Div's 2d Bde, will allow evacuation of wounded in a matter of minutes from the deepest jungle. The "forest penetrator" combines a two-hundred foot cable and personnel sling, with an electrically driven take-up reel. Once the rescue team is contacted by radio, they fly by helicopter directly to the pickup site. Hovering over the jungle canopy, they lower the forest penetrator through the tangled growth to the jungle floor. 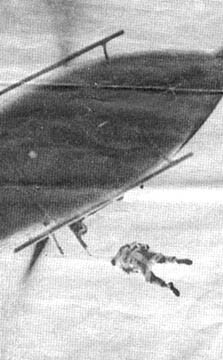 On the ground, the wounded man is strapped into the carrying sling and hoisted up to the evacuation helicopter. In a matter of seconds he is headed toward field hospital treatment. During the demonstration of the recovery system, 1LT Derry Gallagher of Fair Haven, N.J. and Chap (CPT) Carter Tucker of Monticello, Ark., rode the skyhook the full two hundred feet. "It's a fabulous ride as well as a very practical medical device," said Tucker after climbing out of the recovery ship. Gallagher recalled his earlier experiences as a platoon leader on Operation 'Junction City'. "I wish we had one of these then," he said, "after I was hit during a firefight, they had to carry me a thousand meters to the nearest clearing." For soldiers wounded too badly to ride the sling, the rescue helicopter is equipped with a special litter. Both can be used successfully in the thickest jungle. 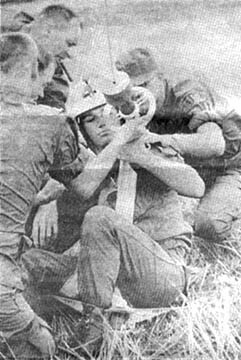 "The recover sling can also be used in mountainous areas where choppers cannot land," explained demonstrator CPT Barry Fitzgerald of North Albany, N.Y. "With it, we can litterally pick up wounded soldiers anywhere in Vietnam" he said. It was just another mission for the Air Force crews, but for the men of the 25th Div's 1st Bde civil affairs office, it was the birth of a new concept in psychological warfare. According to 1LT Marvin Sessions, psychological operations officer at division headquarters and originator of the idea, air strike targets are hit twice - first with bombs and then with a new series of Chieu Hoi leaflets. "You have witnessed only a small part of the death and destruction that awaits you" the leaflet states, "rally at once to the GVN." After each air strike some 3000 leaflets are dropped followed by an equal number of safe conduct passes. DAU TIENG - Two thousand students and only seven classrooms equal a very over-crowded school and overtaxed teachers in any country. Four additional classrooms to ease the load have recently been added to the Dau Tieng elementary school with the help of the 3d Bde, 25th Inf Div. Beginning several months ago, the program to refurbish the existing school building and to build four new classrooms started with the Vietnamese providing all the labor and the Civil Affairs Office of the 3d Bde providing the materials and technical assistance. All the classrooms received a new coat of paint, had existing roofs fixed, and new screening and doors were added. The desks, which had seen the pranks of little children who just can't resist the temptation to write their name in the wood, were systematically refinished or replaced. Outside in the playground, new swings and see-saws were constructed. Finally, the four new classrooms which were started from scratch, were completed. In the ceremony which dedicated the new classrooms, the principal of the school was awarded a new bell which he will use to call the children to school. An artillery shell casing had been serving in the capacity of school bell. Attending the ceremony were representatives of the 3d Bde, Vietnamese district officials, and the 2000 students who will benefit from the new classrooms. Soldiers of the 25th Inf Div's 1st Bn., 27th Inf "Wolfhounds," move out on a combat sweep 65 Kms northwest of Saigon. The men are taking part in the 2d Bde Operation "Kolekole." A classic example of an Air Mobile operation at brigade level and one of the largest air mobile operations to date was recently launched by the 269th Cbt Avn Bn in conjunction with the 25th Inf Div. All three battalions of the 2d Bde, 25th Inf Div were airlifted into a heavily wooded area five miles west of Go Da Ha near the Cambodian border to begin a massive search and seal operation. The entire foree was moved in less than one and one half hours. 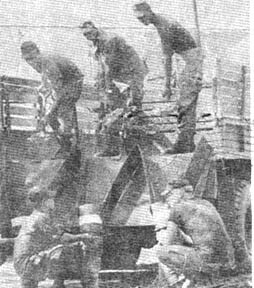 The highly synchronized operation included the many Pickup Zones (PZ's) being operated expertly by the 269th "Black Barons" Pathfinder Detachment "Caveliers", who readied both troops and cargo for their airmobile delivery. Due to the close proximity of the Cambodian border, the area was extensively prepped by heavy artillery strikes which preceded the numerous gunships' prep of the Landing Zones (LZ's) prior to the slicks entering. Timely co-ordination between the Ground Commander and the Air Mission Commander was essential to the success of the operation due to the enormous size of the Air Mobile force and the limited weather conditions which prevailed throughout the entire operation. Despite a ceiling of less than l,000 feet, the multi-lift missions continued on schedule. 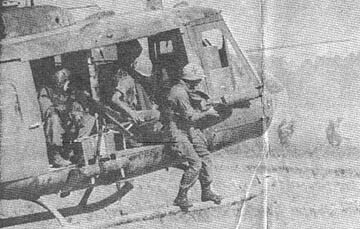 The 1st Bn (Mech) 5th Inf the 1st Bn 27th Inf, and the 2d Bn, 27th Inf of the 2d Bde, 25th Inf Div were airlifted from three field locations near Trang Bang and Go Da Ha into six separate landing zones. The operation which called for precise, well-planned and executed flights by the five assault helicopter companies involved, was conducted in five two-company flights and one single company flight. On one occasion as many as forty troop carrying helicopters made simultaneous landings in two different LZ's. The Air Armada included the 116th "Hornets", the 187th "Black Hawks", the 188th "Black Widow", all from the 269th Combat Aviation Battalion "Black Barons". The 173d Aslt Hel Co "Robin Hoods" and the 162d AHC "Vultures" from the 11th Cbt Avn Bn also participated in the action under the operational control of the "Black Barons". Twenty gunships from the respective companies involved, besides prepping the many LZ's, helped seal the eastern and western boundaries of the large area with machine gun and rocket fire. The gun teams involved included the 116th AHC "Stingers", the 187th AHC "Rat Pack", the 188th AHC "Spiders", the 173d AHC "Cross Bows" and the 16th AHC "Copperheads". The 269th Cbt Avn Bn smoke ship "Smoky Baron" covered for the approaching slicks; laying dense smoke screens in six of the Landing Zones. The heavier Infantry equipment was later carried in by Chinook helicopters from the 205th Aslt Spt Hel Co "Geronimos" under the operational control of the "Black Barons." When SSG Kenneth L. Latta raised his hand the other day not very much happened. He was presented a piece of paper; received hearty congratulations; blinked when a flashbulb went off; and . . . oh, yes, was given a check for $9,907.00, the largest Variable Reenlistment Bonus ever awarded in the 25th Inf Div. Latta took the six-year path of enlistment from LTC James H. Merryman, commanding officer of the 269th Cbt Av Bn. Ten crew chiefs and ten gunners are responsible to Latta in his present position as a maintenance supervisor with the 116th Aslt Hel Co. He and they assure that aircraft will be available for flight whenever they are needed. Having served three years in the Army as an infantryman (1955-1958) and four years in the Navy (l959-1963), Latta decided he wanted to make a career of the Army. After completing basic training in 1965 he was assigned to Ft. Lewis, Wash., as a fixed wing aircraft mechanic. When asked for his reaction to the unusually large bonus, he said, "Well, its only money, but that wasn't why I re-enlisted anyway." With a wife and five children waiting for him in Seattle, he does expect to be able to find something to do with the money. Latta will soon complete eighteen months in Vietnam. Suffering from a heart defect since birth, 13-year-old Nguyen Thi Nam has had the operation that will save her from an early death. The defect was discovered last September when Nguyen was examined by CPT Jerry Crooks, a doctor from the 25th Med Bn, during a 25th Div Medical Civic Action Program (MEDCAP). Through an interpreter, Crooks learned that the child became very tired after the least amount of exertion. Noticing the defect, Crooks sent her to the 7th Surg Hosp at Cu Chi for a complete examination. Medical officials pinpointed the defect and found that it had to be corrected or the child would suffer gradual deterioration and death would occur before she reached the age of 25. Crooks made immediate plans for the operation. Delayed because the 7th Surg Hosp had moved, a re-evaluation made in November 1966 revealed that the operation had to be postponed. In April 1967 another evaluation revealed her condition was favorable for the operation. The following months were spent in locating a specialist to perform the delicate operation and getting permission from the Vietnamese government. 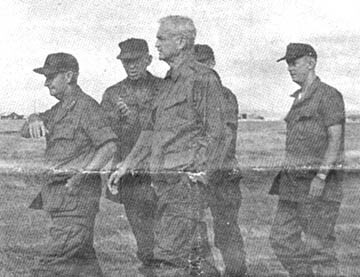 Crooks completed arrangements just before his return to the States, Surgery was performed on Sept. 5 by CPT Daniel Cunningham, surgeon with the 3d Field Hospital in Saigon. CPT Anthony Caprio, a doctor with the 25th Med Bn, has taken over Crooks' interest in the case and reports, "Nguyen is coming along fine. Her blood pressure is up and so is her spirit, and should be going home in a few days." DAU TIENG - Two children in a family found by 3d Bde, 25th Inf Div, troops in a search and clear operation southeast of here recently were saved from permanent physical damage when they were "dusted off" for medical treatment. While searching the area southeast of the Michelin Rubber Plantation a patrol of the 2d Bn (Mech) 22d Inf, found a family in which the little boy had fallen off a bicycle and injured his foot. Through inattention the scrape on his leg had become infected and was spreading over his leg rapidly. The boy, seven-year-old Dinh Van Ho was evacuated by an OH-23G observation helicopter along with his sister, two-year-old Dinh Tri Han, who had an infection in her ear, to the battalion aid station where both were treated. While the medics worked on Ho's foot, they received a baleful look and a few tears. After the cleaning was complete some candy from a C-ration can brought a cheerful smile. A twelve year old Vietnamese boy recently teamed up with 25th Inf Div soldiers to help in the fight against Viet Cong terrorists. It was early in the morning at the 1st Bn (Mech), 5th Inf, base camp when a small boy approached the barbed wire perimeter. Before the soldiers could chase him away, the boy had spotted one of the unit's Vietnamese scouts and called him over to the wire. He told the scout that he knew where the Viet Cong had planted a mine, and would lead me men to it. "With the aid of armored personnel carriers, SP4 Walter Hunt of Rocky Mountain, N.C, the unit's intelligence clerk, and the boy were taken to the spot the mine was supposed to be buried. "The boy was scared to go near the mine," said Hunt, "so he told us all about it from a distance." A fast moving 25th Inf Div soldier recently saved the life of an old Vietnamese man who had run in front of a U.S. night patrol. The patrol, from the 2d Bde's 1st Bn (Mech), 5th Inf, moved out just after midnight with the mission of detaining a known Viet Cong official. Blocking forces were set up behind the VC's house with orders to detain anyone to their front and fire on anything behind them, since VC patrols had been reported in the area. On the patrol leader's order illumination lit up the area and a raiding party swept toward the house. An old man, frightened in his nearby house by the noise and light ran into a field to the rear of the blocking force. PFC John Phillips, a grenadier from Blackville, S.C., apparently the only one to see that it was just an old man ran for him, shouting to the others to hold their fire and pushed him to safety. The patrol leader gave Phillips credit for saving the old man's life. "The light was very poor," he said, "one more second and the blocking force would have opened up." The sweep continued, but the house was found empty. SSG Jack Cassiba, a 25th Inf Div mess sergeant, claims a record for having served under fifteen company commanders in the same company. Cassiba, a native of Linden, N.J., was assigned to the 21st Inf in Hawaii in 1961. There he served as first cook of Alpha Co for four years. In 1963, the 21st Inf became the 1st Bn (Mech), 5th Inf, and in 1966 was deployed to Vietnam. By this time Cassiba, still in Co A, had become mess sergeant. Since then he has extended his Vietnam tour twice. "When my time runs out," he says, "I'll probably extend for a third time. As long as Alpha Co is with them." The Viet Cong in Hau Nghia Province have invented some mighty nasty booby-traps, but there's a 25th Inf Div soldier who will swear that natural booby-traps are just as dangerous. SP4 Larry Barnett, a team leader with the 2d Bde's 1st Bn (Mech), 5th Inf. was probing a hedgerow during the unit's Operation "Kolekole." Barnett said he was trying to keep a sharp lookout for booby-traps, "but the mosquitoes were so thick they distracted me," he said. "All of a sudden the ground gave out from under me." Barnett had stepped into an old well perfectly camouflaged by a tangle of vines. "I caught the top edge as I went down," he said, "but I knew I couldn't hang on too long." Loaded with heavy combat equipment, Barnett says he could hear clods of dirt hit the water far below as the sides began to cave in. Just as Barnett began to slip his squad leader, SGT James Hayden, heard his shouts and ran to help. They hooked arms just as Barnett was about to fall. CPT Wallace C. Christy, the 8th Arty's Bn Surgeon, has been helping those in need long before donning the insignia of an army doctor. Born of missionary parents in what is now West Pakistan, Dr. Christy grew up in a land where East meets West. His high school, situated in the lofty Himalaya Mountain range, was formerly for dependents of British army officers. This too reflected the changing scene where he spent his first twenty years. After two decades away from his unseen home Dr. Christy returned to the United States to study medicine. While in medical school, he met his future wife, 2LT Barbara Christy. LT Christy is currently assisting as a nurse at the 25th Div's 12th Evac Hospital. This husband and wife medical team practice the "healing arts" of medicine to benefit those in need. Infantrymen of the 1st Bn, 27th Inf, figure they know what they're talking about when they say Hau Nghia Province is heavily booby-trapped. 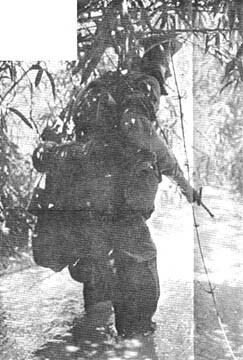 On as recent sweep 39 kms northwest of Saigon the 25th Div troopers fired their rifles at likely looking ambush points along the trail ahead, a common tactic known as reconnaissance by fire. Twice, the bullets snapping into the brush detonated heavy Viet Cong booby-traps. With little advance warning, the counter-mortar radar section of the 1st Bn, 8th Arty, "march ordered" their gear and radar system to participate in the first airlift of a counter-mortar radar set within the 25th Inf Div. As soon as the system was free home the chopper, the killer battalion's five man crew put the set in operation in less than an hour.